Right when Return of the Jedi was about to hit theaters across America, bringing the epic Star Wars trilogy to a resounding close, China was experiencing its own Star Wars-esque craze following the 1982 release of The Shaolin Temple. Chinese had been force-fed propaganda screeds for decades, featuring impossibly brave Communists and sneering, evil Japanese invaders, or at best kitschy musicals on the resplendence of Mao Zedong and how gloriously red the east was, and always would be. By the 1980s, Chinese were glassy-eyed followers of a defunct cult. Mao had died in 1976, taking the insanity of the Cultural Revolution with him. Suddenly, a short Sichuanese veteran of the rebellion, Deng Xiaoping, was talking about opening up and reform, about making money instead of weaving together red sashes and smelting pig iron in a backyard furnace. Right at that critical point in time, a classic kung fu flic was released, and it blew a billion minds. The Shaolin Temple was filmed in and around an ancient Buddhist temple, the cast were almost all national wushu champions or opera troupe vets, and the director hailed from Hong Kong, an adventurous territory flaunting shiny, once-forbidden baubles. It was a raucous plot, thick with violence and rebellion and religious undertones. There was dog meat, righteous drunkenness, and every kung fu move you could dream of. Not a single red flag, Communist trope, or ode to Mao. It hit China like a Super Star Destroyer into a beleaguered Death Star. “The Chinese press has warned that some teen-agers get too preoccupied with wushu. China Youth Newspaper reported that books on the martial arts were selling out as fast as they appeared and that practice sessions even took place on street corners. Some youths have run off to Shaolin Monastery on the forested slopes of Songshan Mountain east of Luoyang, under the misconception that its monks still taught the martial arts. Wushu as a sport exploded; kung fu as an art was brought back from the dead. Cinema in China would never be the same. This was the blockbuster action film to complement the New China emerging from a half century of destructive ideological nonsense. It would usher in a golden age for martial arts in China, blow up Hong Kong’s film industry, and captivate a generation of inner city American kids. Jet Li debuted in The Shaolin Temple as Jue Yun, the son of a rebel who watches his father die at the hands of Wang Shichong’s generals. He escapes and makes it to the temple where he learns kung fu and waits to get his revenge. In the process he joins the monks and their martial arts instructor, starts a small romance with his shifu’s kung fu daughter, and saves the man who will rule all of China in a few years, Li Shimin, the Tang emperor Taizong. Jet Li leaps into battle after watching his father get ganged up on. The plot is based upon an actual historical encounter between Shaolin warrior monks and the Sui dynasty general Wang Shichong’s troops, in a critical battle that helped Li Shimin establish the Tang dynasty in eastern China. Li was the second son of Li Yuan, the Tang Emperor Gaozu, who had established the dynasty in 618 at Chang’an (Xi’an). Wang fought on in the east of the country around Luoyang, just a few miles north of the Shaolin Temple, hoping to establish his own Zheng dynasty as a rival to the Tang. 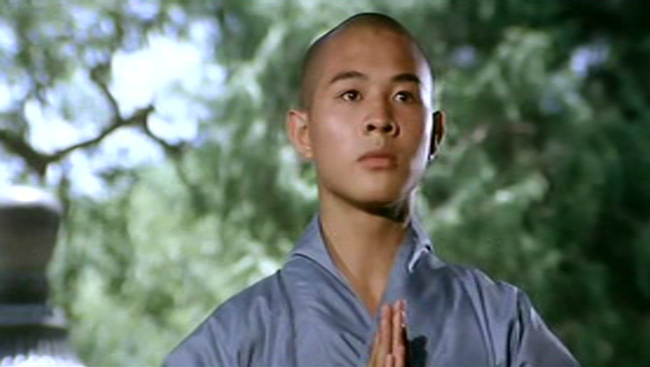 In the final battles, the Shaolin monks took a strategic pass from Wang’s troops and captured his nephew, Wang Renze. Five days later, Li Shimin crushed Wang’s Sui ally Dou Jiande and Wang sued for peace. The movie deviates from the historical record, turning a small raid on a strategic fort into a pitched battle on the steps of the temple, but the basics are the same. Jet Li, whose real name is Li Lianjie, was just 19 when this movie was being filmed, but he was already a five-time national wushu champion training with Chinese wushu godfather Wu Bin. Li turned out to be a pretty good actor, an unexpected boon for director Zhang Xinyan who had earlier decided to recast wushu performers and try and turn them into passable actors, instead other way around. The real treat was his wushu though. The classic scene for wushu enthusiasts is the “training through four seasons” performance toward the middle of the movie, after Jue Yun has failed to avenge his father and returns to the temple to improve his martial arts skills. ​Just a normal day at the Shaolin Temple. This was the first time wushu as an art form was able to hit the screen and reach more than a billion eyeballs. Several big time wushu champions starred in The Shaolin Temple, so the fight scenes grew more and more epic as the film went on. By the time the character work had been done and most of the audience was aware of who was who and what motivated them, Zhang unleashed his wushu cast. The last 40 minutes or more of the movie are just mass battle scenes featuring intricate face-offs between anyone who wasn’t an extra. Each battle is separated by a filler horse chase. After a few more pitched battles, chases, and rescue missions, Jue Yuan finally gets his shot at the man who killed his father. Every weapon in the wushu arsenal is whipped out in this crazy fight that ends abruptly with a sword thrust to the chest. No hesitation at all when the monk-to-be Jue Yuan has the chance to land the death blow. The struggle to be a good Buddhist is a thread that runs through the movie, from the very beginning, when Jue Yuan considers whether or not he can keep from killing someone, to the very end, when he thinks real hard about the celibacy vow he’s asked to take. It’s clear from the very outset that Jet Li’s character is one of those wild monks who gathered about the temple to escape the banditry and chaos of medieval China. ​Dog makes a delicious meal. The abbot too, calls for the wild monks to “release them, guide their souls to heaven” when the soldiers of the Sui general Wang Shichong wreak havoc in the temple. The abbot - and through him the Buddha - gives the fighting monks permission and religious license to go to war. It’s in effect a Buddhist call for jihad. Jet Li has murder on his mind. Religion in this film is in all ways subservient to needs of the state. Remember that religion was outlawed and persecuted right up until 1976, just three years before the initial filming on the project began and China in 1982 was still Communist in policy, even if the economic and social control of the Communist ideology was crumbling. Director Zhang Xinyan walks a very fine line between promoting religion and Buddhist principles and advocating righteous violence against oppressive, corrupt usurpers, in service of a true ruler. 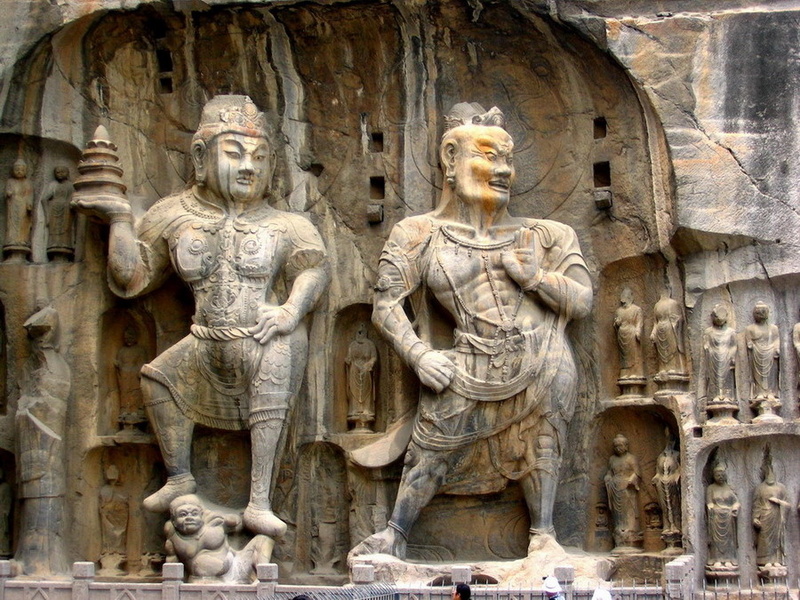 An interesting historical note: the scene in the film when the emperor-to-be Li Shimin and Yue Jun hide out in large caves surrounded by Buddhist figurines carved out of the rock was filmed at the Longmen Grottoes, one of the world’s great collections of Buddhist carvings, just a few minutes drive outside of Luoyang. Monks and artists began carving figures into the limestone cliffs a few hundred years before the events in the movie take place, and it’s likely that bandits and monks and runaway emperors could have hidden out here for a while. I can think of few cooler places to have a hideout. Shaolin was a scattered relic of a place in 1982. About a dozen monks and an aging old patriarch who had seen the temple burn to the ground in 1928 and stood by as Red Guards ransacked the place. It was a windswept ruin ducking down and trying to avoid the blows dealt out erratically by the changeable, angry zealots in charge of China’s vast bureaucracy. There is a photo of She Dechan, the head Buddhist in charge (it wasn’t until 1999 that the government appointed an abbot, the first since 1664) in 1982, the year the movie hit the scene. He has a smile on his face. His successor, Shi Dequan, would lead China during the tumultuous years following the movie, when thousands of wannabe Jet Lis converged on Shaolin and nearby Dengfeng Town. Shaolin became an overnight sensation, tourists came in busloads and martial arts schools opened up all around the area. A heady mix of kung fu guys emerging from the bushes and charlatan shadows trying to get in on the mix crowded out the monks who had been there before the explosion, when Buddhism was a reactionary evil. Over the next two decades, the small schools on the fringe of the temple’s territory would swell to thousands of students, with teams competing all over the world. One million tourists a year would walk through the temple grounds. Dozens more movies would be shot on location and the Shaolin brand would become a household name all across the world. Today’s temple, a flourishing business and wushu assembly line, owes its current wealth and status to the movie, The Shaolin Temple, which came at exactly the right point in time to blow way the scraps of Communist living and usher in a golden age for Chinese martial arts and kung fu cinema.